I’ve never used Suse or openSuse. As I’ve mentioned before, I’ve been a “loyal” Fedora user since Fedora Core 1 and I have Ubuntu on my laptop since it had awesome laptop support. I even got some Suse CDs as a prize for the Letter of the Month from Linux Format magazine. However, I never even tried it at that time as I was mad at Novell for the Microsoft pact. I think it lends a lot of credibility to Microsoft’s BS argument that Linux violates its patents. But it’s been a few years and nothing horrible has happened because of the Microsoft pact and it came as a liveDVD in the latest Linux Format Magazine. I was trying to wait until KDE 4.1 came out for Fedora so that could be my first experience with KDE 4, but that’s been delayed nearly a month now (while they, rightly, fix some bugs) so I decided to go ahead with the Suse review. 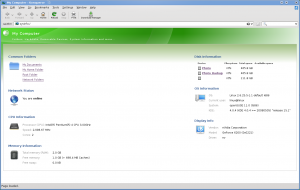 Suse is the second oldest distro that’s still around. It started off as being based off of Slackware and later on was somewhat based on Red Hat, borrowing rpm and some other technologies. Since then it’s gone off on its own and is now considered one of the big boys. A few years after Red Hat shelved its personal distro and converted over to the community-sponsored Fedora, Suse decided to do the same thing with openSuse. Just like Fedora, they’ve had some uneven releases. 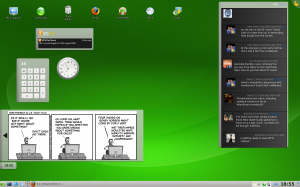 However, openSuse 11 is supposed to be their comeback release. 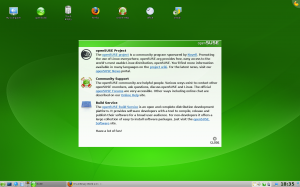 Historically, Suse has been one of the biggest supporters of KDE as the default desktop although that has fallen off a little seince they’ve been trying to compete with Red Hat in the business world. 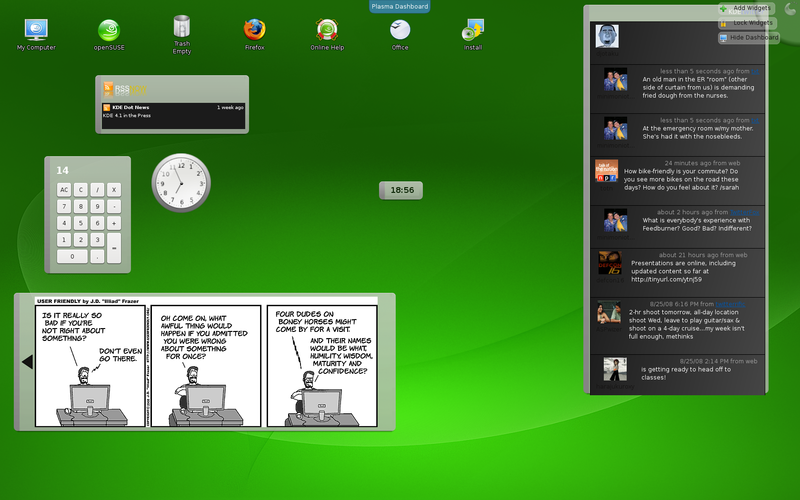 It’s important to note, however, that Novell’s Suse team has put a LOT of work into their KDE desktop. This liveDVD is running KDE 4.0, yet they didn’t seem to have any problems getting icons on the desktop. Lots of people were complaining about being unable to do so in Fedora and other distros using KDE 4. Apparently, they just didn’t take the time that Suse did to engineer a really good KDE 4 release. (Frankly, I’m surprised that Siego didn’t point to openSuse 11.0 as an example of a well-implemented KDE 4.0 release!) They’ve also solved the problem of the ugly black panel that was too large. So, plus points go to Novell’s openSuse/Suse KDE team. They deserve an applause for doing this so well! 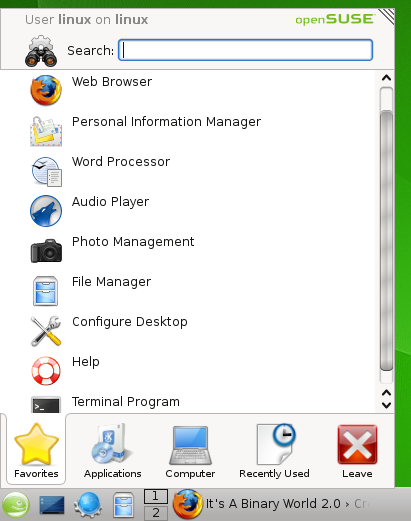 Novell has the KDE program menu that has annoyed so many people. One of the things I’ve always loved about KDE was the fact that it had a favorite (or most run) programs section on the start menu. Sure, there are some that believe that if you’re going to run programs that often you should have them as launchers on your taskbar. But that can make taskbars look a bit cluttered. Also, I think the most used program portion of Window’s Start Menu is one of the things they got very right with Windows XP. (I’m not sure if MS innovated that or copied it from somewhere) This menu is a good menu and doesn’t deserve all the hatred it’s received on the net. It just needs a couple of tweaks to make it perfect. The first problem with it is that if your mouse wanders down to the Favorites, Applications, etc portion of the menu, it switches you to that section. I think a click should be required there to keep people from accidentally switching. That was the biggest complaint most people had and it can be fixed so easily. No need to throw the baby out with the bath water. One other thing that was a bit unclear to me was how to go back on the applications hierarchy. The skinny arrow on the left is not noticeable enough – at least not the first time it catches you off guard. 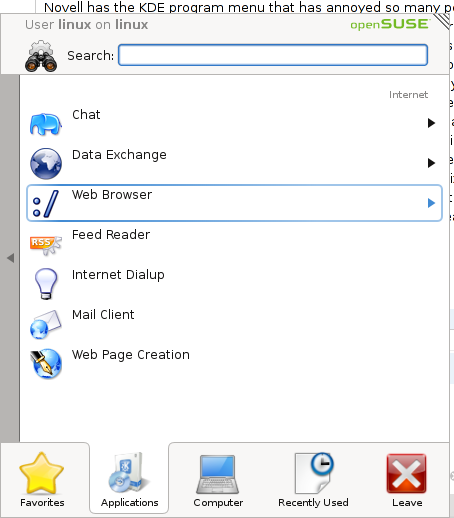 Widgets…it’s one of the biggest, most talked about innovations of KDE 4. There is a lot of innovation going on in KDE 4 and if they can get past the KDE 4.0 stigma, I think they may end up surpassing Gnome with this release. 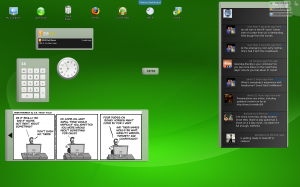 With Superkaramba, KDE has always done widgets so much better than Gnome. Gnome’s desklets always seemed a bit kludgey and tacked on at the end. Superkaramba always felt like it was part of KDE; even before it was added as an official part of KDE 3.5. Now, with Plasma, the KDE team hopes to take them to the level of Apple’s OSX widgets. In fact, OSX widget compatibility is either in KDE 4.1 or coming in KDE 4.2. Wow! If you’ve only seen the same old screenshots of a calculator, a click and a notepad, you haven’t seen the true power of the widgets. First of all, they have quite a few new ones now. You can see that I have a comic viewer, an RSS feed, and a Twitter feed. All of these came from the default “add widgets” dialog. I’m surprised, especially given the popularity of Twitter, that no one has showcased these widgets yet. I’m thouroughly impressed that we’ve moved beyond simple system monitors and weather widgets (although I’m sure those are coming soon enough!) They’re very easy and intuitive to position and configure. And, one of the problems I always had with widgets on any desktop was that if I had all my programs open, they were less helpful to me. Well, by clicking on the little button by the gecko or the top right corner, the plasma dashboard view is activated. 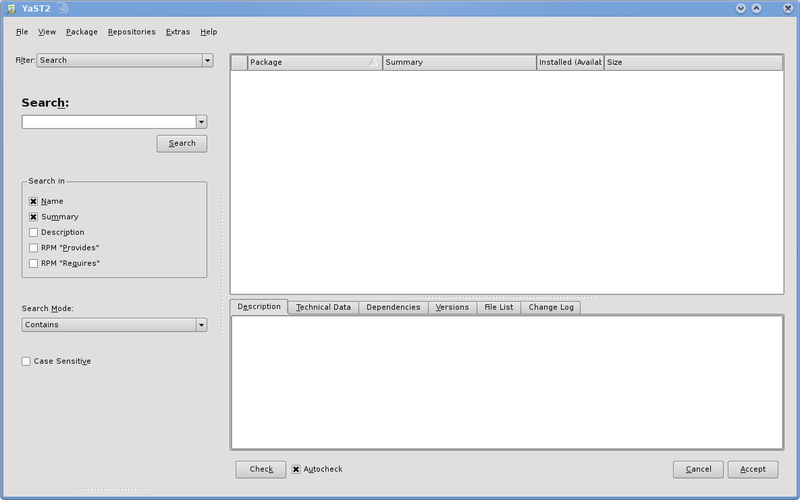 This minimizes your programs and brings the widgets to the forefront. A simple click on the desktop brings your programs back! Couldn’t be easier. They’re also very pleasing to the eye with their drop shadows. They move smoothly and appear with a little fade-in. Very nice. As far as programs go, they have a pretty standard set. OpenOffice.org provides the office suite. Again, like with Mandriva, this is a little bit out of place since they could use KOffice. However, I know that OpenOffice.org has much better compatibility with the suite from Redmond. Interestingly, GIMP and Krita don’t seem to be included – but then again, it’s a liveDVD. I’m sure it’s in the repositories. In fact, let’s check out Yast, their control center. It appears to control any setting you might want to change. Plus points for them for making it all nice and organized. In fact, they seem to be on par with Mandriva here in terms of everyting you could possibly want in one place. 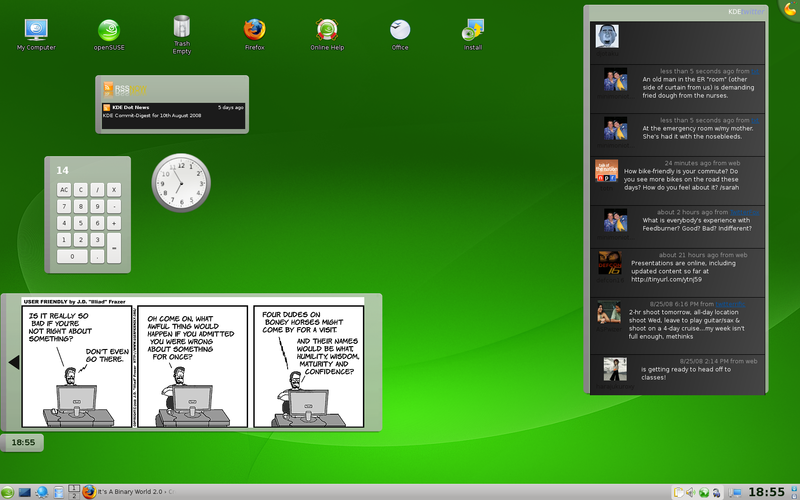 Minus a very small point for it not looking as pretty as Mandriva or even as pretty as the rest of openSuse 11.0. From here we can install programs. Let’s see how well that appears to work. I have to say that it is indeed ugly to look at. I couldn’t really get a good feel for it as it didn’t have repositories defined. I’ve really become much more of a fan of PackageKit’s interface. (Which I’ll talk about in my Fedora review) More and more Gnome-based distros are moving to PackageKit and I think there’s even a KDE version of Packagekit. It works very well for package management and you can’t argue against the value of a consistent interface across distros. I really, really like this page that it loads up. It is very useful for locating places on your computer AND for getting information. To get the same info in Windows you’d have to open up “My Computer” AND right-click on “My Computer” and click on properties. Here you have some quick links to “Common Folders” and also you can see that it recognized my NTFS hard drives. You also have all the key information you need in order to get help from someone: kernel version, distro, KDE version, graphics card driver, graphics card info, CPU info, and the total and free RAM. Just one look gives you everything you need to know. And I want to finish up with just a quick look at some of the neat finishing touches that Novell has done with openSuse. Now, this is probably a KDE setting, as opposed to Suse, but good on Novell for leaving it in. There are many things I like about this setup. First of all, the expansion button is not next to the exit button. The number of times I’ve been frustrated by accidentally closing a window when I meant to resize it is just too numerous to count. Also, the up arrow makes more sense to me than Microsoft’s icon. It’s just that we’ve been around with the Microsoft implementation for 20 years. So, what’s my final verdict? 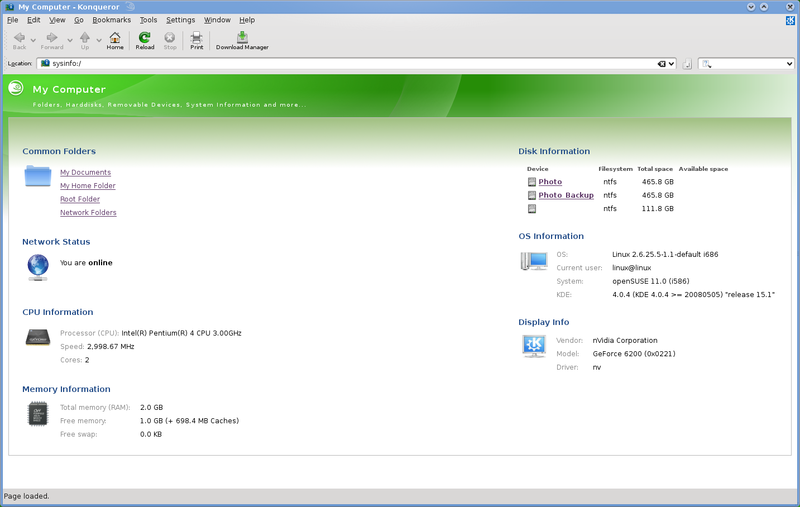 I think Novell has done a really, really good job with openSuse 11.0. Unlike Fedora, they did a very good job with the unfinished KDE 4.0 and turned it into something usable. Lots of visual finishing touches make the distro just feel professional and not hacked together. There are a few rough edges here and there. I also didn’t test out flash, MP3 playback, or DVD playback. I presume these can all be downloaded from some third party repository in some country where they don’t implement silly things like software patents. Except for the still touchy subject of the Microsoft deal, I’d recommend Novell to someone who was new to Linux but ready to learn. It doesn’t have the same hand-hold style of Ubuntu, so that’s still my top choice. Right now it’s really almost a tie between recommending Mandriva and openSuse as the next best thing after Ubuntu. Fedora is often broken due to being bleeding edge and I wouldn’t recommend it to someone brand new to Linux. Of course, there still is the patent deal and they either did it to make themselves more palatable to companies than Red Hat (thus having bad motives) or they had to satisfy investors (which they legally must do in the USA). So I guess that would break the tie and give it to Mandriva. But Novell has made a top notch distro and if they can get over the negative press from the Microsoft deal (and there are websites like boycottNovell to prevent that), then I think openSuse may end up on more magazine covers and start to steal some of the thunder away from Ubuntu. Excuse me, sir, gnome has never surpassed KDE in features, customization, and looks. And the gap is just getting wider. openSuse 11 surpasses Mandriva 2008.1 in many, many ways: opensuse uses the go-oo.org version of openoffice which includes several optimaisations and features that the stock openoffice.org doesn’t whereas mandriva uses stock openoffice. 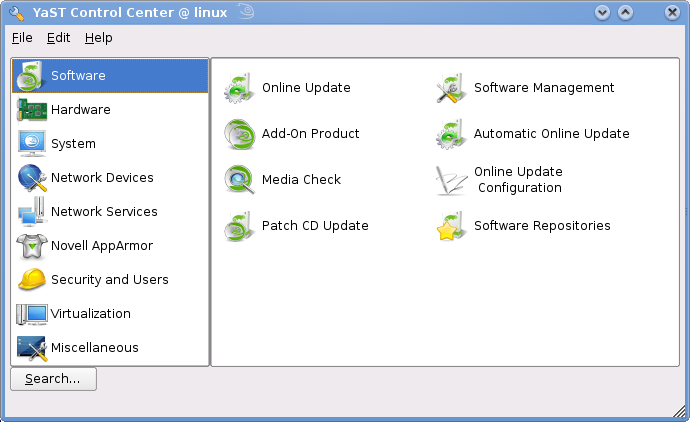 opensuse’s package management is slicker, faster, more feature rich and includes the one click installation feature directly from many web sites. opensuse is faster even on older pc’s in my view, not only in terms of start-up but also in many other ways. Use opensuse for a couple of days and you’ll see how much the opensuse team have done to make this a linux distro polished unlike any before. That was a very nice and inforamtive review. A rare thing these days. I have had a Suse11 DVD lying around idle for around 20days now. @whitespiral I generally agree with you. KDE has always had more features and stuff. What I meant was surpassing Gnome’s popularity. While KDE has always had more features, it hasn’t had to aesthetic polish that Gnome has had. And, in my experience, KDE has been a lot more unstable in the 3.x series. But now KDE looks slick, feels well put-together, and more stable. It looks like they did a very good job on the art team with complementing the great job the coders have done. @Raymond K: Good info. I knew about the optimizations to OpenOffice.org, but I forgot them when I did the review. My hope is that Sun can open up the process and “truly open source” OO.o by allowing people to roll in changes easier. If they don’t, I think most Linux distros are just going to end up using Open Suse’s version and de facto opening it up for them. On your other points on why it’s better than Mandriva – thanks for the info. Although I’m not installing any distros at this time, I think it will be helpful knowledge for others wondering which one to use. @krejzihors: Thank you very much! Your comment makes me really happy – I try, as much as possible, to separate emotions from evaluation of engineering. @Gigi: Excellent! Come back and let us know how it went! @Fred: Oh, so there you go – it’s exactly what I said. If the Suse Version of OO.o is that much better than vanilla OO.o, then everyone’s going to move to that one. “…they could use KOffice.” KOffice may be fine for those without real office needs. It may be fine for those distros that release CDs targeted at other Linux users. However, many potential new-to-Linux converts need and look for real “office” capabilities. If OpenSUSE releases a live CD for the purpose of introducing new users to Linux, then it really should show these new users that Linux offers capable office tools. @Anon: Yeah, it was a bit of a tongue-in-cheek comment. I know that KOffice 1.x is not as fully featured as OpenOffice.org. It’s more of a comment on KDE’s deficiencies. I have used many versions of Suse Linux, and always liked it. But this one is just not a great brew! (OpenSuse 10.3 was much better!). This version should have at best a Beta version, not even a _RC (release candidate). The Suse team has often done an outstanding job, and I hope that the next release reflect again this. I hope that basic issues like NVIDIA/ATI drivers install, and wireless capabilities are also resolved. Top be honest, I do not care much for the “eye candy”, it should come after basic usability, functionality. If “eye candy” is the bait to try a distro, usability is what make us stick to it. Will OpenSuse match Ubuntu stability (*) and usability? that Ubuntu’s, crude but effective. *: OpenSuse 11.0 online update, made the system totally unusable, I am a “Linux geek”, and could fix it, but this is quite a turn off! @Jeffersonian: It would be easier to fix Nvidia problems if it were open source. Distros are at the mercy of Nvidia’s engineers. I, for one, am grateful they provide drivers for Linux at all. But, if things don’t work, they community can’t help them since they feel the need to keep it closed source. The complaints that so many people have had about the opensuse kickoff menu have been unfounded and based on their ignorance of the fact that the features they hate/request are already included. I’ve found it amusing that people mention how they hate the way hovering on a tab switches to it, when in reality, that option can be changed by simply right clicking on the menu and selecting Application Launcher settings. Right click also lets you switch to the default kde menu. SCO was wrong about linux infringing on their patents. It didn’t stop them from taking people to court and wasting a boatload of money and time on both sides before they were soundly beaten. Microsoft is a much bigger company than SCO. Should they decide to do something similar, they can afford to waste more money and more time. Even worse, they can afford to go the way of the RIAA and MPAA and sue individuals, which I really wouldn’t put past them. The deal with novell allows microsoft to bow out gracefully, without having to admit they were wrong. It’s called diplomacy. The world would be a much better place if more people used it. We all know microsoft doesn’t have any ground to stand on, but now, you won’t hear a peep from them about patent infringement and all opensource advocates can devote their time to making better software. All without a single dime spent. So what if microsoft wasn’t publicly humiliated? In essence, novell achieved what IBM did with SCO. In fact, I’ll go as far as saying they did even better, because they managed to do it while maintaining positive feelings on both sides.